A leader’s most important job is creating and constantly adjusting this strategic bridge between goals and objectives. Strategy or “strategic thinking” often refers to the work engaged by leaders of an organization, but just because someone is power is thinking, doesn’t make it strategic. A common mistake is to create goals, visions, budgets and/or “key priorities” and call that strategy. They are NOT. All good strategies have what the author calls a “kernel”. They are a diagnosis of the primary challenge(s) and obstacle(s) faced by the organization, a guiding policy for how the organization plans to approach or overcome the challenge(s) and a set of coherent actions and resource commitments designed to carry out the guiding policy. Why is Good Strategy So Rare? A good strategy is rare because it requires leaders to make a choice, and say not too many things in order to say yes to a very specific thing. Good strategy coordinates efforts and has a thesis that may or may not be right, but forces the organization to move in a particular way. Many times leaders are unwilling to take a stand or can’t get everyone to agree on one approach. A clear example of the kernel: In the early 1990′s Iraq invaded Kuwait. After months of air strikes failed to resolve the situation, the US led a ground offensive to throw back the now 500k+ Iraqi ground force in Kuwait. Guiding Policy – we will follow Operations, the Army’s keystone warfighting manual, specifically the “most important offensive manuer” – envelopment – which avoids the enemy’s front while striking the flank or rear. Coherent Actions – use air strikes to soften up the enemy forces, quietly move a massive 250k troop force well West of Kuwait and move them into the empty desert of southern Iraq, use a small contingent of Marines in the south to feign plans for a frontal assault and finally make a massive flank strike at Iraqi forces. This was a very simple strategy that worked well primarily because of tight coordination and some misdirection. The main fighting only lasted 100 hrs and coalition casualties were very limited. Competitive advantages are interesting when you can find ways of increasing their value. In other words, what can you do with this advantage that will lead to better outcomes compared to someone else? Focus on finding ways to 1) deepen the advantage, 2) broaden it, 3) create higher demand for what the advantage offers or 4) make it harder for others to get this advantage. You cannot deduce your way to great strategy. Thinking strategically is analogous to thinking like a scientist – you need to form an educated hypothesis based on data and facts but then pursue experiments with unpredictable results. 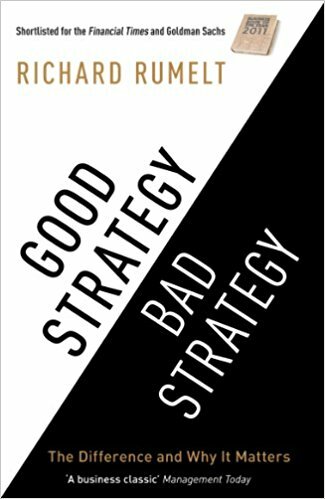 The good strategy rests on hard-won proprietary knowledge, new strategies are based in part on insights and ideas, pursuing a strategy will generate new proprietary knowledge. Complex situations make people uncomfortable and most people, including business executives, will grab on the first idea they come up with and accept early closure. It often feels to scary to discard an idea in pursuit of a new insight so most people don’t do it. Strategic thinkers will keep going and look at the situation from different angles and perspectives, allowing them to come up with a better answer. One way to break your myopia is to create a virtual board of experts that you consult on strategic matters. This is not as crazy as you might think, as we are good at integrating people’s worldviews+personalities to the point where even imagining what they would say can trigger new ideas and open new lines of thinking. Another way to improve your judgment is to pre-commit (and ideally write down) your judgments for things that have not yet come to pass and review later to see if you were right. Use this to calibrate your thinking. The discipline of analysis is to not stop there, but to test that first insight against the evidence.